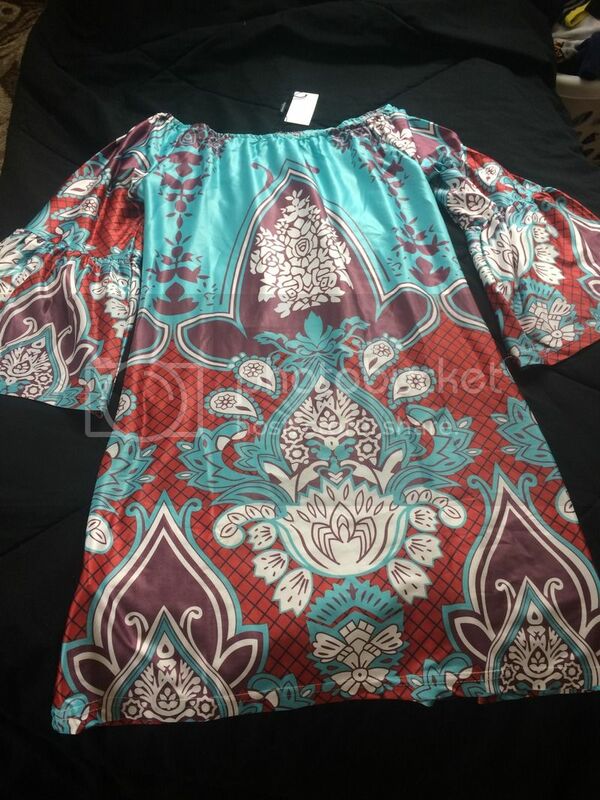 Today, I have another opportunity to review this nice Women's Off Shoulder Geo Paisly Print Flare Sleeve Shift Mini Beach Dress, size Medium from Choies. I am intrigued of how it looked like personally and so I purchase and examined the item. The shipment of this product seems to take at least 2 weeks the day I placed my order. The size I got is also smaller than I thought. I referred to their size chart provided here, but it seems that it is still smaller because I have been purchasing order and it seems like Medium is fit as expected - even bigger a little bit for me. This is in US sizes, and I am 100% Asian, with Medium size and I am not sure that the sizing coincides. The print is also vivid in the image yet, when I get the product it seems like it is a little bit off than what you actually see online. But the prints are wonderful, unique design. Judging from the one I received, the fabric is thin and like a polyester kind. I tried to wear it as an off shoulder and seems like the elastic is stronger than I thought, for me not to wear it on my shoulder. The body cut is definitely straight. I thought it was something like a triangle, but not. Sewn properly, I don't see any loss thread nor of fabric. I would say getting a bigger 1x than your size would be the best way for you to do. Nice design! I've never worn off-shoulder clothes before but would love to see if they suit me or not. Off shoulder dresses and blouses are perfect for the warm weather. Although, I am still hesitant to buy clothes online. That is the color of spring Mommy Nova. I want to see how beautiful you are wearing that paisley top.